Out of Japan comes another object storage provider called Cloudian. We talked with Cloudian at Storage Field Day 7 (SFD7) last month in San Jose (see the videos of their presentations here). Cloudian has been out on the market since March of 2011 but we haven’t heard much about them, probably because their focus has been East Asia. The same day that the Tōhoku Earthquake and Tsunami hit the company announced Cloudian, an Amazon S3 Compliant Multi-Tenant Cloud Storage solution. Their timing couldn’t have been better. Japanese IT organizations were beating down their door over the next two years for a useable and (earthquake and tsunami) resilient storage solution. Cloudian spent the next 2 years, hardening their object storage system, the HyperStore, and now they are ready to take on the rest of the world. Currently Cloudian has about 20PB of storage under management and are shipping a HyperStore Appliance or a software only distribution of their solution. 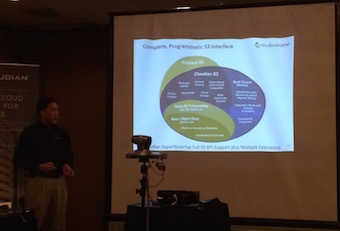 Cloudian’s solutions support S3 and NFS access protocols. Their solution uses Cassandra, a highly scaleable, distributed NoSQL database which came out of FaceBook for their meta-data database. This provides a scaleable, non-sharable meta-data data base for object meta-data repository and lookup. Cloudian creates virtual storage pools on backend storage which can be optimized for small objects, replication or erasure coding and can include automatic tiering to any Amazon S3 and Glacier compatible cloud storage. I would guess this is how they qualify for Hybrid Cloud status. Cloudian creates a HyperStore P2P ring structure. Each appliance has Cloudian management console services as well as the HyperStore engine which supports three different data stores: Cassandra, Replicas, and Erasure coding. Unlike Scality, it appears as if one HyperStore Ring must exist in a region. But it can be split across data centers. Unclear what their definition of a “region” is. Each Quorum – replicas are written to N/2+1 nodes in each data center before responding to client. There are corresponding read consistency levels as well. The objects writes have a “coordinator” node which handles this consistency. The implication is that consistency could be established on an object basis. Unclear to me whether Read and Write dynamic consistency can be different? Apparently small objects are also stored in the Cassandra datastore. That way HyperStore optimizes for object size. Also, HyperStore nodes can be added to a ring and the system will auto balance the data across the old and new nodes automatically. Cloudian also support object versioning, ACL, and QoS services as well. I was a bit surprised by Cloudian. I thought I knew all the object storage solutions out on the market. But then again they made their major strides in Asia and as an on-premises Amazon S3 solution, rather than a generic object store.